I’ve not seen or heard a Selby & Friends recital for some time; renewing acquaintance, the most obvious change has been in audience size. From the years when numbers were thin at Melba Hall, patronage has swollen to the point where seats are at a premium because the Edge space last night was sold out. Maybe people were attracted by an all-Beethoven program; perhaps the combination of Melbourne Symphony Orchestra co-concertmaster Dale Barltrop, the Australian Chamber Orchestra’s principal cello Timo-Veikko Valve and Selby’s brave, polished pianism made an exceptionally attractive proposition. Those music-lovers who managed to hear this recital were treated to a bracing tour of achievement peaks from the composer’s middle period. Putting her guests to best use, Selby programmed a sonata for each, framed by two piano trios – one that’s almost not there, the other a trail-blazing masterwork. In terms of substance, the No. 12 Trio offers little: one movement, an Allegretto that consists of a simple minuet, soon over and leaving not much impact. A curtain-raiser, then, but one with a muted vivacity, particularly the piano part which holds the lion’s share of the (admittedly brief) action. Beethoven’s final violin sonata, No. 10 in G Major, comes as a relaxation of tension after its famous predecessor, the A minor Kreutzer and follows that irregular oscillating pattern of power and placidity in the composer’s output – the jocund B flat Symphony between the Eroica and No. 5 in C minor, the rollicking alla tedesca Piano Sonata No. 25 sitting between the deeply-felt A Therese and Les Adieux pieces, that amiable Op. 74 Harp String Quartet sitting between the voluble final Rasoumovsky and the terse, unsettling F minor. For all its approachability, the last violin sonata has not appeared regularly in chamber music programs, not as often as the Spring or C minor favourites. Commentators have found a sort of farewell to arms in this work which comes from the centre of Beethoven’s middle period but which was, as a form, ignored by the composer from then on. Selby and Barltrop performed it with an unfussy relish, both well-matched in the question-and-response opening strophes and maintaining a calm path through even those pages that tempt most to declamation. As with all three major works on this night, the players had searched out a mode of operating that sprang from the score’s possibilities; rather than the usual smash-and-grab display of temperament, this was a considered, mutually respectful interpretation, riveting in passages like Selby’s negotiation of the low-lying chords and octaves that support the Adagio‘s opening statements, and later in the interlocking cadenzas of the finishing Allegretto where the usual flashiness was avoided and the work’s sinewy power spoke for itself. The most familiar of the cello sonatas, the middle No. 3 in A Major, proclaimed its intentions from the start as well. Timo-Veikko Valve outlined the unaccompanied first melody with restraint and the two brief cadenzas that tail each sentence were made to count as integral to the preliminary statement, rather than being tossed off as flourishes. When the movement proper began, both performers set a steady pace – Allegro, but not too much, as the direction requires – and at every turn you heard something new; not necessarily unexpected, but a shift in focus like a paragraph-ending rallentando, a hitherto-unknown doubling of the bass line, weight applied sparingly and not the often-encountered mindless pounding. More than this, the work held an unusual fluency, best heard in the last movement where Selby in particular negotiated the octave runs with a sotto voce grace and provided Valve with a true partnership like the miraculous moment at the centre of the movement where the cello has the main theme and the piano’s accompaniment of a rolling A Major triad supports it with a balalaika-style rustling – the effect here and the detail of accomplishment at many other stages achieved through innate musicality and a fine depth of preparation by both executants. As you’d expect after this groundwork, the Archduke realization proved exceptionally fine: determined in attack, meticulous in dynamic balance, both strings ideal in their close ensemble work, most evident in the chain of sixths and thirds at the start to the Andante cantabile and the interleaving sustained notes at the movement’s end. But the performance was loaded with extraordinary moments, like Selby’s strong Weber-reminiscent chord/arpeggio upward bounds punctuating the Scherzo‘s trio, the precision of her rapid trills in the finale and the amiable sharing of sound-space between the musicians with every contributor audible throughout. We may wait some time before coming across a reading as enriching, informative and spirit-lifting as this one. Pairing the Ives Piano Trio with Dvorak’s F minor No. 3 presented something of a surprise in this latest recital at the MRC from an estimable ensemble of Melbourne musicians: violin Elizabeth Sellars, cello Molly Kadarauch, piano Caroline Almonte. While the Czech composer pours out a chain of luxuriant melodies tinged if not infused with folk-song suggestions, the American’s one essay in the form leavens his love of dissonance with a strong melodic current running through its outer movements, atypically diatonic in the concluding Moderato con moto where the spectre of 19th century Romanticism looms unexpectedly large. It wouldn’t be Ives without contrasts and the trio’s central Presto makes a relentless, eventually unnerving amalgam of non-original melodic fragments that lead to a critical climax which exhausts the ears through simple informational overload reinforced by forceful dynamic levels. Ives might have intended a brand of levity by naming the movement TSIAJ (This Scherzo is a joke) but the humour is fierce, a case of piling Pelion upon Ossa where the references to hymns and popular tunes weld into a massive complex, extraordinarily dense given the small sound resources employed. Dvorak’s trio stands as one of the master’s more dramatically consistent chamber music constructs, particularly for its substantial first movement’s grandiose sweep and developmental density. Despite many caveats, the influence of Brahms remains consistent throughout; open to a page of the first Allegro‘s development and the actual physical aspect of the score makes you look twice. Yes, you can also point to irregular metrical structures that the older writer would not have used but the textural variety offers many grounds for complementary comparison. Further, the writing for piano is often as clangorously dominant in effect as in an early-to-mid period Brahms chamber work. The Sutherlands made fine exponents of the Ives trio, Kadarauch giving the first movement’s opening duo section plenty of wide-ranging eloquence, followed in similar form by Sellars when her turn to outline the 27 bars of material came around. For that helter-skelter scherzo, the effect was of diving in with suspenseful energy, the players beavering at their responsibilities without drawing breath. This is the Ives sound as many people find it – ignoring the lashings of broad, singing simplicity to be found in the symphonies, violin sonatas, string quartets and tone sets sitting alongside the polytonal, polyrhythmic, poly-polyphonic, multi-textural collages of the Three Pieces in New England or the jagged piano writing of the Three Page and Concord Sonatas. Here the impetus came from Almonte’s keyboard which, as required, often threw the two strings into low relief. Ives moves into a less frenetic world for his finale, the language kept simple and accessible with lengthy paragraphs of interwoven mesh, the whole reaching the composer’s individual vision of the transcendental in a sequence of concluding variants on Rock of Ages, a meditation here played with care and requisite placidity: a passage that you wished could go on and on. The Dvorak trio also enjoyed more of a clenched-teeth style of interpretation, Almonte finding plenty of resonance in the outer movements, which featured passages where Kadarauch’s cello was kept well-recessed. Still, you would be hard to please if you found the focal Poco adagio deficient: Sellars and Kadaurach combining in the canonic melody-lines with fine sympathy, all performers at their most persuasive in the B Major middle segment where the dark tenor of the work dissipates for a time. In fact, the main problem with this interpretation came from an underlining of its already sombre character. While the Ives presented sonorous challenges and consolatory ease in turns, this Dvorak impressed as over-determined, so that the twists into and out of action in the concluding Allegro lacked a balance between heft and lightness, the impact more of a relentless drive. Dvorak was living through emotional stress at this time but I think that this interpretation hammered that historical message with excessive vigour in the score’s two supporting outer pillars. 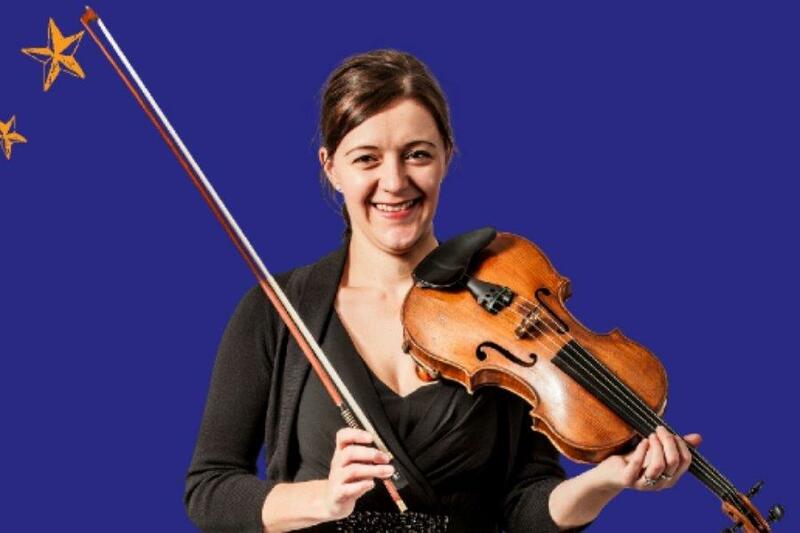 A new group on the local concert-giving scene – well, new to me – the Virtuosi has spun out of the MCO ranks over the past year or two and comprises some very familiar faces. The central organization’s artistic director, William Hennessy, heads the second violin trio, Lerida Delbridge from the Tinalley String Quartet is Virtuosi director, the violas are veterans Justin Williams (also a Tinalley member) and Merewyn Bramble, cellos Michael Dahlenburg and Paul Ghica (Bramble’s colleague in the Patronus Quartet), and the double-bass-of-all-work is the dependable Emma Sullivan. Last night’s program, to be repeated tomorrow in the Melbourne Recital Centre, impressed as a consolidation of core repertoire for a string ensemble of modest numbers. A tad circumscribed in personnel for string orchestra staples like the Bach Brandenburg Concerto No. 3 (which needs a third viola and cello) or Vaughan Williams’ Tallis Fantasia (its subdivisions require extra personnel in every section), the group still contrived to put together a successful sequence of familiar works stretching from Boccherini and Mozart, through Tchaikovsky and Holst, to a new work by Australian writer Nicholas Buc with the provocative title A Little Night Music and set alongside Mozart’s sparkling serenade of the same name. The Virtuosi began with the expatriate Boccherini’s appreciative Night Music on the Streets of Madrid, although I missed hearing the first segment dealing with the Ave Maria bells as the performance seemed to launch straight into the Soldiers’ Drum phase, two violins doing the honours in that phase from opposite sides of the Edge’s internal walkway. But the main segments showed a well-rehearsed body with an appropriately fluid approach to rhythm; the only question arose in the Passa Calle where Dahlenburg’s solo melody line could have been projected with more aggression, particularly as the chief accompanying texture was pretty much continuous pizzicato. In fact, the night’s soloist was Dahlenburg who took the central role in both Tchaikovsky offerings: the Nocturne and that melting moment, the Andante cantabile from the D Major String Quartet No. 1 in Tchaikovsky’s own arrangement which moved the pitch up a semitone, it seems, but graciously gave the cello an opportunity to play the folksong-indebted theme that it alone does not get to treat in the original score. The solo strand travelled well in the Edge’s large air-space, with only a moderate vibrato employed and a fine sensibility brought to bear that let the music speak for itself, more clearly in the Andante than the Nocturne where the accompaniment, well-intentioned and firm, was overbearing in the piece’s later, mildly decorated pages. Both the Eine kleine Nachtmusik and Holst’s St. Paul’s Suite enjoyed sterling interpretations, the Mozart cleanly executed with loads of animating dynamic variety and supple phrasing, especially in the simple but demanding Romanze where the violins resisted its temptation to gild the melodic lily. Later, the English suite featured fine solo work from leader Delbridge and Williams’ diplomatically understated viola in the Intermezzo that alternates languour and ardour in just a few brilliant pages. For both of these essential scores, the musicians spoke with impressive unanimity, realizing the promise shown before interval in a high-spirited run-though of Mozart’s F Major Divertimento K. 138 – another necessity for any string orchestra to have under its belt. Buc’s new work has few obvious problems for its interpreters. The work’s content is neatly constructed, the phrase-lengths predictable, its atmosphere suggestive of a standard film noir accompaniment – moody but not tragic, unabashedly lyrical, high on string colour, no pretensions to depth of meaning. Buc has constructed an amiable nocturne and the Virtuosi, with the backdrop of several regional performances behind them, gave it a confident airing. As a commissioned foray into modern music, A Little Night Music represents a tentative enough move; now for more challenging fields – Schoenberg or Tippett, anyone? In this final 2015 recital given by a consort notable for the high calibre of its members, the five contributing composers were producing work during England’s Caroline Era, the reign of Charles I which tore the country apart and, in the process, put much of its cultural heritage in peril; not just music, although we tend to slide past these particular decades between the brilliant ferment of Tudor composition and the brief-lived glory of British music that is Henry Purcell. For this occasion, Ludovico’s Band comprised six instrumentalists, including the extra triple harp of Hannah Lane to partner co-director Marshall McGuire’s instrument, with guest mezzo Sally Anne Russell singing works by Nicholas Lanier and Shakespeare’s known collaborator, Robert Johnson. The timbre melange for this brief recital, which included purely instrumental music by William Lawes, John Jenkins and some scraps from John Playford’s Dancing Master compendium, gave top-line honours to Julia Fredersdorff’s violin, with a fellow-string in Ruth Wilkinson’s gamba occupying a supple support role except for a D minor trio sonata by Jenkins where the pair shared the work-load with occasional harp interludes. 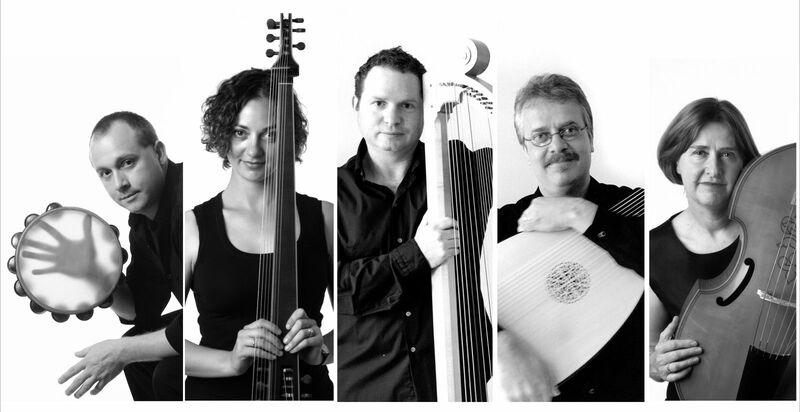 But for the most part, plucked instruments dominated, the harps partnered by Tommie Andersson’s alternation between theorbo and lute, Samantha Cohen also employing her theorbo but working through a good part of the night on her guitar. The result, when all were engaged simultaneously as in the opening D minor Harp Consort by Lawes, No. 4 in the set of the eleven, made a rich tapestry, a generous buzzing brought about by an inevitable arpeggiation when harps and theorbos each play more than one note. This work’s opening Fantazy saw the melodic burden shared between Fresersdorff and McGuire, both preserving the music’s innate stateliness right through to a noticeably vigorous, if brief, sarabande. A less generous amplitude came in the same composer’s Duet for lute and harp, Andersson and McGuire handling with seasoned aplomb the work’s three-dance chain, the whole lasting about 4 minutes, with little variety of dynamic inflexion. Russell’s arrival onstage brought a novel strand to the mix, largely because this singer eschews the peculiar habit adopted by some singers of works a century either side of this period; to wit, aiming for a near-genderless purity with minimal vibrato, an avoidance of dramatic possibilities and a concentration on purity of line – no swooping, no audible breaths, no distinct plosives. Russell took her four Lanier songs as scenes, the settings of Thomas Carew’s No more shall meads and Mark how the blushful morn infused with a warm vigour of attack, reaching even more intense levels in Campion’s Fire, fire and the vivid bite of Neither sighs, nor tears, nor mourning. The mezzo entered into each song’s emotional world and, while the effect could be over-pronounced in intensity, the works spoke clearly, each one taking the listener on a short trek as engrossing as a Schubert lied if more reminiscent of an extended recitative than a lilting folk-song. Johnson’s setting of the Ben Jonson lyric Have you seen but a white lillie grow was the best-known piece on this program, Russell giving two verses and hence a chance to take in her security of pitch at the lyric’s climax and the flexibility of tessitura while her accompaniment was relatively thin with lute and theorbo. Woods, rocks and mountains, possibly/probably by Shakespeare, also gained from a more direct voice, its Dowland-like downward falls and hopeless repetitions of one note speaking cogently of love’s despair in this interpretation, rather than communicating a well-bred, light soporific depression. For O let us howl some heavy note, a rough-edged invitation from a madman in Webster’s The Duchess of Malfi, Russell took relish in the chromatic rises that illustrate the character’s unbalanced state and found plenty of room for near-onomatopoeic imitations as the air moved from ‘beasts and fatal fowl’ to some not-too-quiescent swans greeting their own extinction with placidity. Even in the benign context of a comfortable evening recital in Melbourne’s salon, this piece holds an uncomfortable force that Russell conveyed with a full-bodied and mobile style of execution. Concluding with five of the Playford dances, the band again illustrated its elasticity, a wealth of bass strings resonantly rhythmic and, for a bonus, Ruth Wilkinson took up her recorder to cut through the string textures, focusing your attention on the the simple but infectious brio of the tunes on which these players built a rousing harmonic ambience, a window into (musically, at least) more simple and clearer-speaking times. Finishing their annual subscription series, director Frank Pam and his chamber orchestra paid tribute to one of the more congenial musical friendships between two great composers. Mozart and Johann Christian Bach met in London in 1764 and became fast friends, the younger composer claiming that the English-based youngest son of Johann Sebastian had a formidable influence on his instrumental writing. Both blazing successes at moments in their careers, the two men died in penurious circumstances. As a sign of his esteem, Mozart arranged three of the elder writer’s keyboard sonatas as concertos and performed then on his trans-European tours, providing the originals with his own orchestral framework. Taking this one step further, the notable Israeli clarinetist Yona Ettlinger re-arranged the Mozart score, changing the solo part to fit his own instrument and adding a third movement to the original two, neatly transplanting the second Allegro from Bach’s own Sonata Op. 17 in E flat. This was the piece that the Musicians performed yesterday with soloist Lawrence Dobell, principal clarinet with the Sydney Symphony Orchestra. As you’d expect, the reading was distinguished by a fluent, polished line from Dobell, at home with the mutated galant style that came across despite the permutations intervening between the original and this reworking published in 1974. Easy in its melodic flow, the concerto makes no extraordinary demands, not even in the cadenzas which Dobell dispatched effortlessly; but then, they are brief, I suspect because there is little thematic matter to be exploited. Appearing a little later in Mozart’s life, the Symphony No. 27 is the last of six written in 1773 and precedes the superb work in C Major of the following year, the opening phrases of which are forever associated for many of us with the Music Lovers’ Hour hosted on ABC Radio by Dr. A.E. Floyd, one-time organist/choirmaster of St. Paul’s Cathedral and a Melbourne musical institution as well as a Mozart enthusiast at a time when the composer’s works were rarities on concert programs. Not that the G Major K. 199 suffers in comparison but the jump in assurance between the two symphonies is noticeable. Pam’s orchestra made a hearty start to it, the violins bracing in their triple-stop chords and observing the dynamic niceties set up by their conductor. The body was blessed by pairs of forthright flutes and horns, the latter making their presences felt in tutti passages and coping manfully with parts that rarely challenge a modern instrument. The second movement’s progress could hardly be faulted in terms of articulation although the strings, especially when muted, sounded plump, not quite altogether on the beat. In fact, the rhythmic factor presented the only real difficulty in all three movements; at the cross-over points before repeats, everyone seemed hesitant and the players needed to keep closer focus on Pam during the Presto-finale: a model of transparency demanding a confident and exact attack. 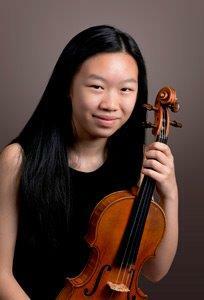 Appearing in another work from the teenage Mozart, young violinist Jackie Wong performed the solo part in the G Major Concerto, a light-hearted masterpiece for the most part calculated to flatter an executant’s suppleness of delivery and asking for a clear, light-coloured product. At 14, Wong obviously sees the score as an exercise in bravura, tending to make heavy weather of her outer movements, which is understandable in passages of semiquaver figuration. When the solo violin has the floor, however, there is little point in a weighty dynamic, particularly as Mozart kept his accompaniments discreet. In the melting Adagio, Wong made a better impression, letting her line speak without over-insistence; a welcome contrast to the first Allegro’s exposed cadenza where she urged so hard that the danger became one of tuning. The Musicians coped well enough with their responsibilities, apart from a cracked horn note or two, and the trio of second violins showed an admirable consistency throughout. To complement the woodwind concerto, Pam finished the afternoon with one of Christian Bach’s Op. 3 sinfonias, the last of the set of six and, like most of this program’s content, in the gratifying and congenial key of G Major. Three movements in the space of ten minutes left little time for absorption except that the bookend Allegros sounded confident while the middle G minor-centred Andante found out occasional intonation problems in the top strings. Still it made a brisk, optimistic conclusion to the year’s work from this always-ambitious body of performers. 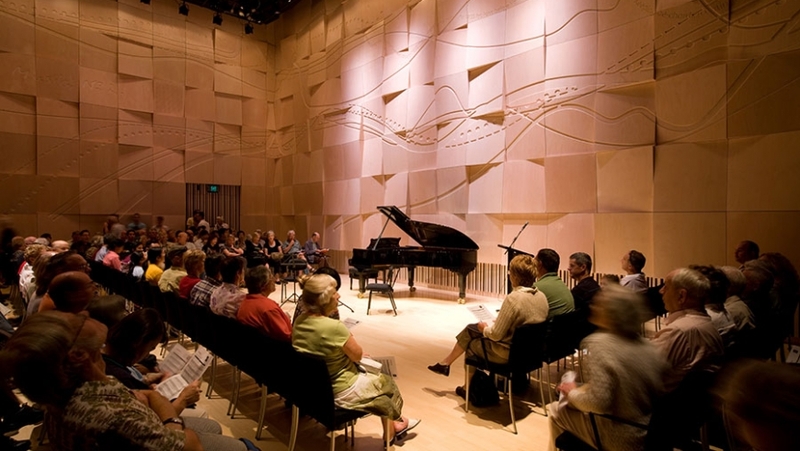 Giving its last recital at the MRC before moving next year to the glass-and-wood complex of Federation Square’s Deakin Edge, this estimable period-music ensemble opted for an all-Hispanic program, one that continually shot off in southern colonial directions. Director Danny Lucin’s cornetto and an instrumental septet played a few instruments-only pieces but much of Saturday evening’s recital consisted of sung material in which La Compania supported soprano Cristina Russo. This was a mini-tour in 14 segments, some of them quite short, of Spanish music at home and in the American colonies which stretched from religious music of the early 16th century to Peruvian dances constructed close to the start of the 19th. Of course, the physical provenance of the works was reflected in their categorization, religious and secular, with a fair mixture of both. To all of it, the Companians gave their best with crisp attack and a rousing realization of this music’s rhythmic vehemence. To begin, the players worked through some diferencias on an anonymous theme called Las Vacas; basically, a ground bass with elaborations on top or around its progression which gave a sample of the sound-colours on offer: Lucin’s rapid bright line, Mitchell Cross’s all-purpose dulcian (a precursor of the bassoon), the supple sackbut ((early trombone) of Glen Bardwell, David Irving’s refined violin, and two supports in the gamba of Victoria Watts and Rosemary Hodgson’s alternating vihuela and guitar. Icing on this particular cake came from percussionists Denis Close and Christine Baker, both prominent contributors throughout with drums, tambours, gourds, and eventually the inevitable castanets. Russo’s pure timbre soon became a single strand in an anonymous Dennos lecencia senores, a cachua or round dance from Peru where the whole ensemble participated, not aggressively but making enough of a sonorous edifice to background all but a powerfully projected voice. This overpowering also took place in a villancico by Antonio de Salazar, Seville-born but a Mexican composer. His Tarara tarara qui yo soy Antoniyo continued the Christmas theme that ran through the program but, with both sackbut and dulcian out of the mix, Russo enjoyed more exposure, her clear timbre taking prime focus and the text became decipherable. Two pieces by Gaspar Fernandes – born in Portugal but moved to Mexico and Guatemala – showed a lively invention, if also presenting the players with a real challenge in A belen me llego, tio with its punctuating syncopations that did not quite succeed in their effectiveness when essayed by an ensemble like this one with widely differing dynamic possibilities; from what I’ve heard, the piece works much better when singers – either individual or several to a line – are involved. A brace of Francisco Guerrero pieces succeeded more satisfactorily, Russo enjoying the backing of Hodgson alone for the opening to Virgen Sancta, another Christmas villancico with a surprisingly mobile melody line. Moving back to Peru c. 1780, the anonymous El Congo brought to mind a late Baroque mariachi band with bright triplets and an arrangement rich in upper reeds seasoned with a catchy percussion support. Fernandes appeared further down the program with an Assumption song, Vaya, la princesa, vaya, which might have enjoyed more impact if the vocal line had not been doubled, as was the case in No hay mas dulce alegria where three instruments took on that duty in turn. A return to the ambience of the night’s opening, Santiago de Murcia’s Los Imposibles is a passacalle which seems to follow the same bass as the Las Vacas tune. More familiar to me in a guitar solo setting, this made comfortable listening thanks to some deft interwoven solos. And to conclude, the company played yet one more Peruvian anonymity: Nino il mijor, another cachua of infectious if restrained jubilation at the presence of the Christ child. Once more, La Compania here unveiled some treasures to which it brought a distinctive approach. If the soprano was treated as just one thread in the group’s complex, at least she remained audible, even under some assertive, full-bore output from her colleagues. Nevertheless, many factors generate delight when hearing this company, the most significant being its unique combination of finesse and spirit, especially when the ensemble girds up its loins for one last variant. Now for a new home and three nights of further discoveries in 2016. Over a fairly short period, the Eggner Trio – comprising brothers Georg, Florian and Christoph – has become a familiar presence on Musica Viva‘s annual guest artist schedule. After winning the Melbourne International Chamber Music Competition twelve years ago, the ensemble then visited Australia on three further occasions. This fourth time, the programs on offer both begin with a Schumann work – one from Robert, the other composed by wife Clara – and then the nights centre on Dulcie Holland’s 1944 Piano Trio; one of those scores more talked about and extolled in the abstract than performed. The final offering brings matters back into the mainstream for any patrons rattled by the preceding novelties: either Dvorak’s Dumky or the magniloquent Brahms in B Major. For their competition final, the Eggners played the major repertoire: Mendelssohn in D minor in the opening rounds, keeping the big Schubert Trio in E flat for the finals and in the process edging out the Ondine Trio who performed the same work with – I thought – a good deal more conviction. In 2005, Schubert in B flat – the more popular one of the pair – enjoyed an urbane airing, along with Schumann in F Major and a refined version of Ross Edwards’ Trio, which had been a compulsory work for all competitors in the 1999 competition. Three years later, the ensemble recycled their competition Mendelssohn D minor, made an ardent experience out of Debussy’s G minor trio – dismissed by some commentators as over-hyped juvenilia – and ran through Beethoven’s first work in the form. I missed the 2011 programs, happily handing them over to another reviewer as the content looked, for once, unappealing. Clara Schumann’s solitary chamber work has a solidity of structure and melodic straightforwardness that prove eminently satisfying, particularly when given as finished a performance as the Eggners provided. The outer movements show a clear-eyed approach to organization, the finale intriguing for its linear interplay. But the work picks up real interest in its Scherzo and the following Andante – simple in its turn from placidity to crisis and back again but crafted with skill and giving each player an opportunity to shine. A major figure in Australian musical life, and not just because of her involvement with the Australian Music Examinations Board, Dulcie Holland studied in London before World War II and the Trio, written after her return to Sydney, shows obvious marks of her training. What shouldn’t surprise, but does, is a firm individuality in the composer’s style; the writing is based on a kind of sophisticated diatonicism but with enough edge to avoid any traces of triteness. Listening to the threatening initial theme of the opening Allegro, you can’t avoid comparisons with similar ominous passages in the work of John Ireland, Holland’s teacher, but the curves and inflexions remain Holland’s own, unnervingly reminding you of the subterranean lurching of the E minor Shostakovich Trio written in the same year. Holland’s score has no slow movement; rather a succession of three fast segments which found amiable exponents in the Eggner players, cellist Florian a committed voice throughout, probably investing more plosive force than the piece needs. As with the preceding Schuman, the reading’s main impact was positive thanks to the group’s warm polish, the ensemble clean and its lines balanced, if every so often violinist Georg showed traces of the reticence which has figured in some of his earlier Musica Viva appearances. With the Brahms Trio No. 1, these musicians demonstrated a control and spacious breadth that informed each page. Many groups have turned this masterwork into a sort of piano concerto and admittedly the keyboard writing is temptingly hefty; the competitions that come around every two years invariably have one set of ambitious executants making a sweat-soaked welter out of these bracing pages. The Eggner approach showed remarkable restraint, the driving climaxes pronounced with weight rather than hysteria, pianist Christoph treating the high passage work in the Scherzo with unfussed celerity, all three members taking time with those slow, melting arches that distinguish the Adagio, as do its sustained moments of dangerous exposure: a moving conclusion to an intelligent, original recital. The Eggner Trio will play again in the Elisabeth Murdoch Hall on Saturday November 21 at 7 pm. Saturday’s fine concert from Paul Dyer and his chamber orchestra was controlled by visiting virtuoso Riccardo Minasi, billed as the ‘fearless Italian Baroque violin’ – which is fine, if you have an apt attribution of what it is to be fearless. For sure, Minasi bolts into action at the opening bar to every Allegro; in his negotiation of rapid semiquaver figuration, nothing stands in the way; even with mediocre material, he remains in full-throttle delivery mode, urging his Brandenburg colleagues to maintain their impetus. This style of performance is not exclusive to Minasi, but it is hard to find in many other period performances. An outstanding instance of this approach first struck me when Il Giardino Armonico played their initial tour in Hamer Hall, a program in which machismo and individual flamboyance refreshed many well-worn pages. Minasi operates with less flashiness but the results he brings out are similarly dust-free. Mind you, the Brandenburgers have a head start in this style, as artistic director Dyer asks for the same clarity and vigour from his forces in every program that he himself leads. Minasi compiled a set of nine works for his visit, all written by composers who flourished in Naples and who lived and flourished during that impossible-to-pin-down period of the Late Baroque. Some of the names were familiar – Durante, Jommelli, Leonardo Leo; others were complete novelties, so much so that Dyer indicated that some of these scores by de Majo, Ragazzi, Manna and Fiorenza were possibly being heard outside Naples for the first time. Arcane they might have been in provenance but their impact was continuously benign, the usual developmental tropes showing, and giving in to, the potential for shifting unexpectedly; Durante’s G minor Concerto No. 2 maintained this surprise element throughout its admittedly brief length. Sharing the workload to some extent, Minasi brought members of the ABO strings to prominence in the evening’s second half with a 4-violin concerto by Leo in which he and guest concertmaster Shaun Lee-Chen performed in duo-opposition to Matt Bruce and Ben Dollman, The final Allegro to this remarkably appealing score produced the evening’s most brilliant playing, a style galant promenade loaded with compressed energy and delivered with a flawless sheen. Much the same immediacy and elegance followed in a three-violin sinfonia by Nicola Fiorenza, Minasi and Dollman partnering Matt Greco in a small treasure, all too brief in its last three movements. Other moments had their drawbacks. Both horns and oboes were exposed in an E flat sinfonia by Gennaro Manna, the woodwind pitching noticeably off-centre in the work’s Trio; the brass were required to carry out some rapid trilling in this piece’s first movement which sounded laboured. But then the program’s final offering, Jommelli’s Sinfonia from the oratorio La Betulia liberata found both oboes generating an excellent spritzig timbre while the sinfonia from Domenico Sarro’s Demofoonte remains in the memory for a series of sustained single-note crescendos from the horns, the string ferment riding the blast. Minasi made a strong apologist for this neglected music from Naples which, like much of the South then as now, has always been denied a fair shake of the national parmesan cheese dispenser. In this enterprise, he enjoyed unstinting support from the ABO musicians who played with a confidence and flair that reflected the character of their gifted, personable guest. In an ambitious exercise, the state company juxtaposed Weill/Brecht’s sung ballet – the last significant partnership between playwright and composer – with a freshly-composed Australian cabaret that visited the seven canonical major sins on the nation’s capital cities. Julian Langdon wrote a prologue and epilogue for these modern-day Seven Deadly Sins as well as illustrating gluttonous Adelaide; Mark Viggiani took on Hobart’s envy and angry Perth; Brisbane’s association with sloth was allocated to Ian Whitney, who also had the unenviable task of populating the lustful landscape in Sydney; Jessica Wells tried to persuade us of Melbourne’s innate greed through the person of John Wren, but then had the night’s easiest run with a romp through prideful Canberra as personified by Howard, Rudd, Gillard and Abbott. As with any challenging cabaret, the segments varied substantially in content, with plenty of pastiche from each writer. And writers they were in both senses, providing the texts for their own music, albeit collaborating in workshops to develop the whole enterprise. While each composer gave good musical service with well-regulated instrumentation and generally comfortable vocal writing, the librettos varied in effectiveness and relevance to the vices they were intending to depict. Viggiani’s choose-a-wife contest for baritone Matthew Tng’s amiable Prince Alfredo held suggestions of the Princess Mary/Prince Frederik romance, but his condensation of Perth’s idiosyncratic ire to the Rinehart/Hancock family split failed to make many points about the vice itself, the slapstick depiction of all three characters in the triangle coming across as relatively heavy-handed. Whitney’s two scenes also made a sharp contrast. In Brisbane denizens Pete and Joh (what’s in a name? ), he gained from the services of baritones Nathan Lay and Tng as two exhausted layabouts, while soprano Cristina Russo as a Milton-spouting Angel relished the score’s only lyrical vocal lines. When it came to the bed-hopping character of Sydney’s self-obsessed chattering classes, the overlapping lines of all seven characters generated a clever verbal depiction of swinging relationships, Elizabeth Lewis’ anything-goes Helene a solidly crafted presence in a setting where most other vocal lines were confined to scraps. Under Tahu Matheson, Orchestra Victoria escorted the singers through their tasks with equanimity, from various Latin and Viennese take-offs to the circus-like superficiality of Jessica Wells’ mockery of Canberra’s political flotsam where costuming, mimicry and all-too-familiar verbal tropes took attention away from the musical underpinning. Along the way through the night’s backside-numbing first part, the orchestra also took on Wells’ grim, sonorously weighty depiction of a depressed, working class Melbourne in thrall to John Wren’s betting stables and touts. All of the singers involved were students from the Master of Music in Opera Performance course from Melbourne University’s Conservatorium of Music; two of them – baritone Lay and impressive tenor Michael Petruccelli – also appeared in the night’s second part, the sung ballet that starred Weimar Republic cabaret expert Meow Meow in the lead role of Anna which, in more conventional productions, is split between a singer and a dancer. As part of the male quartet representing Anna’s family, both young students gave firm service alongside tenor Carlos E. Barcenas and bass Jeremy Kleeman, the quartet aggressive, remorselessly stentorian on occasions in handling the chorale-type writing that punctuates Anna’s travels in search of wealth. Matheson headed a larger instrumental body for Weill’s score which impressed for its consistent emotional content. The creators left very little time for their audiences to resent being preached to, no matter how dexterously, about the evils associated with success in a capitalistic world but the scenes, though often discrete, moved into each other without theatrical or musical jerks. While the intent of the work is clearly didactic, its moral, rather than coming over coated in a sugary cocoon of comforting platitudes, remains grim and unavoidable, right up to the bitter if quiescent final bars. Dominating the stage, Meow Meow gave an impressive depiction of Anna, making a splendid impact in the Boston scene where Anna 2 encounters lust in the form of an attractive if poor man, and her other half has to persuade her to do right by the money-expecting family and stay with her rich lover, harnessing lust to the greater good. The singer handled this brief but telling segment with unaffected warmth, not actually milking the situation for its sentiment of regret but communicating simply the double standards in operation as Anna encounters yet another sin in a different civic setting. Both Deadly Sins were staged with surtitles, most helpful in the case of Brecht’s text which was sung in German. Given the staging circumstances – a fairly small ribbon for action front-of-stage with the orchestra as backdrop, the family quartet singing from Hamer Hall’s rear wall – Cameron Menzies’ direction depended largely on Meow Meow’s histrionic talents. By and large, the satire’s onward drive worked fairly well, despite too much emphasis for this observer on the cabaret fall-back of semi-sexual spasms and jerks. Still, the production’s flaw stemmed from these straitened operating circumstances. Despite the lead artist’s best endeavours, the work makes best sense if there are two Annas: one, the no-nonsense and hard-headed negotiating singer; the other, a more flighty, temperamentally unreliable dancer who actually does the hard work to get the truism-touting, corrupt family its home in Louisiana. In this space, a dancer would have been forced to work under improbable restraints, but the lack of one – let alone a corps – lessened the construct’s dramatic impact. This series – a collaboration between the Recital Centre and the Australian National Academy of Music – has tended to air music by composers whose names are familiar or well-established. While Sydney-based Alan Holley is verging on the age requirement for a senior Australian creative figure, his music has rarely travelled to Melbourne; at least, in my experience. All the more welcome, then, that Thursday evening gave an audience of enthusiasts the chance to hear a variety of works covering Holley’s activity over the past eleven years. Thanks to the expertise of a chain of talented young ANAM musicians and the committed direction of curator/trumpeter David Elton, we experienced two of Holley’s larger-framed constructs, interspersed with some solos from Elton alongside a few short pieces that served to illustrate the writer’s skill in finding congenial frames of operation for wind and brass instruments in particular. Canzona for Ligeti begins with an off-stage horn solo – and, no matter what you do, the shade of Britten’s Serenade casts a long shadow – before a short and dynamic tribute written on the Hungarian composer’s death. Clear in its linear interplay and texturally warm and spiky in turn, this set a fairly high standard of expectation for the rest of the night’s content. Comprising a mixed nonet – five strings, three wind, horn – loaded with dream juxtaposes musical images of Australia’s first white settlers with the country’s indigenous peoples, the intellectual/emotional landscapes of both races spelled out in a score notable for some eloquent bass clarinet contributions from Luke Carbon. Here again, Holley employed a varied sound palette, best exemplified by some striking low wind textures supporting a reticent string group. Elton himself performed Ornithologia, splitting its two parts (in reverse order) at either end of a piano trio, the estuaries of time, which, like the nonet, marked a new e. e. cummings period in the composer’s style of nomenclature. The trumpet solo gave the first overt reference to Holley’s preoccupation with birdsong, an influence that colours his work – well, the instances we heard here – and Elton’s eloquent performance gave an object lesson in rapidity of articulation as well as demonstrating an unshakable grip on the piece’s sequence of abrupt sonic explosions. As for the birds, Holley uses a limited and local number of them. There are no Messiaen-like ornate chromatically complex flurries; rather more suggestions than direct imitation although, to be even-handed, a world of difference in intention lies between the Calling section of Ornithologia and the French composer’s obsessively detailed Oiseaux exotiques. Holley, unlike Messiaen, presents as more inclined to use what is available rather than to search out the more arcane sounds of rarer species. Certainly, birdsong adds to the colour, the context even of Holley’s works’ progress, but its use is not all-engrossing for the listener. The piano trio opens with long solos for two of the participants; when the instruments coalesce, your attention tends to wander as the contrapuntal interplay is less engaging than Holley’s exploration of individual lines; as a result, I tended to focus on Iona Allan’s violin or Alexandra Patridge’s cello as distinct threads rather than looking for the score’s ensemble tension. In this program’s context, the estuaries of time opened bravely enough but wore out their welcome, the pools they led to rather brackish despite the interpreters’ clear dedication to the task. The last work of the night, The Winged Viola, was the earliest written, in 2004. Soloist Gregory Daniel met its challenges with fine equanimity, his line piercingly clean in the Salon’ close situation. Like the trio, this is a substantial work and deserved earlier placement; as it was, the lyrical curves and sprightly moments of technical brilliance impressed for their clarity, although the later-written scores already heard held more polished, more tautly enunciated content. Less importantly, this chamber concerto came onto the scene well after the scheduled finishing time of the recital; enervating for those of us with a commitment later yesterday evening.